Are you a San Antonio guru? Be heard and share your experiences by becoming an 210area.com Contributor. Learn More! Are you a local in the San Antonio area? Join your community and Get Connected with others in your area. Join FREE! Nothing to do on New Year’s Eve? Dreading the after-Christmas blues? Don’t fret, we have all the San Antonio New Year’s Eve events for you here, so you can ring in 2018 in style. We’ll add to this list as additional events are created, so bookmark it and make sure to check back in! This New Year’s Eve show some SA pride by celebrating San Antonio’s 300 birthday at Kremlin on the Riverwalk. The covered balcony is the perfect spot to watch fireworks. This is an extravagant birthday party, with a 9:00 p.m. to 11:00 p.m. happy hour serving $3 Lone Star, $5 Suerte Tequila shots and $6 Papa’s Pillar, well drinks and frozen margaritas. Outside of happy hour, this New Year’s bash offers a champagne toast and free party favors, and two balloon drops featuring over $2000 in cash and prizes. Prizes include $500 cash, Kremlin VIP gift certificates, restaurant gift certificates, movie passes and Kremlin gear. Pre-sale tickets are $25 until 5:00 p.m. on Dec. 31, to purchase them call 210-220-1972. Tickets at the door are $30. Head out to the fiesta to celebrate two birthdays this New Years! This New Year’s Eve, kick off 2018 in the newly reimagined Hotel Valencia Riverwalk. Dinner buffet and party packages include an elegant dinner buffet from 8:30 p.m. to 10:00 p.m. with a dessert extravaganza and one Naranja specialty cocktail per person. Complimentary New Year’s Party favors are included, as well as an exclusive entrance into the Hotel Valencia New Year’s Eve party, with DJ, dance floor, and Champagne toast. This package is $125 per person, make your reservation here. If a whole buffet sounds like too much, you can also ring in the new year at Naranja, a sophisticated bar on the Riverwalk. This package includes entrance into the Hotel Valencia New Year’s Eve party, DJ and Dance floor, complimentary champagne toast, and light appetizers. This package is $75 per person, make your reservations here. This event is restricted to 21 and over. Start of the New Year with something new at Hotel Valencia! Rat Pack New Year’s Eve Bash! This year head out to the Messina Hof Winery & Resort to celebrate New Year’s Eve Sinatra style! Come out dressed in your best vintage ensemble and be sure bring your dancing shoes. There will be a contest for the best dancer, so start practicing! A live DJ will provide the music and there will be a complimentary Texas Sparkling Wine midnight toast. General admission tickets are $30 plus tax and a taxi service are $20 plus tax. The party will be swinging from 9:00 p.m. Dec. 31 to 1:00 a.m. Make your celebration a long weekend by booking one of the cottages at Messina Hof's Manor Haus Bed & Breakfast. Cottages include private entrances, living rooms, kitchenettes, and Wi-Fi access. Kick off your New Year’s Eve at the biggest free New Year’s Event in Texas. Celebrate New Years and the San Antoni Tricentennial in Downtown San Antonio with live music on three stages, stars of which will include four-time Grammy award winner Pat Benatar & Neil Giraldo and Grammy-nominated American rock band, REO Speedwagon. A plethora of family-friendly activities will be provided such as carnival games, a Ferris wheel, outdoor movies and a performance by the Magik Theatre in the Tricentennial Garden. 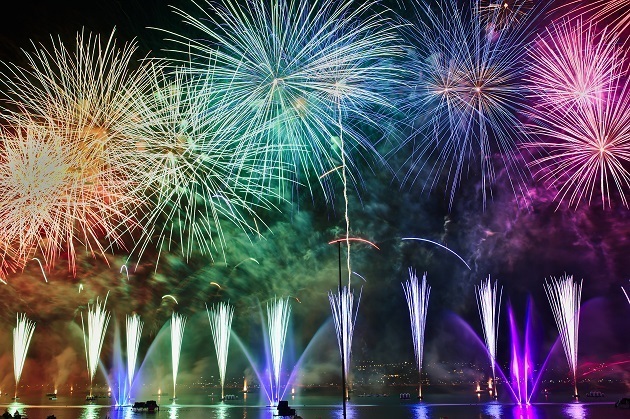 At midnight there will be a stunning firework show with special lighting and pyrotechnics. The celebration runs from 5:00 p.m. on Dec. 31 to 12:30 p.m. Get out to celebrate the New Year and San Antonio! This New Year’s Eve dance your way into 2018 at Howl at the Moon. They’ll be hosting the Riverwalk’s biggest New Year’s party. Book a package for guaranteed seating and dinner buffet from 6:00 p.m. to 8:00 p.m. Also included are party favors, one premium drink ticket, and a champagne toast! All you have to do is show up to the party between 6:00 p.m. and 9:00 p.m. Tickets are $125 per person early, $150 after Dec. 25. If you don’t need a whole dinner but still want to ‘Just Dance’ at he party, you can buy guaranteed admission tickets for $30 per person early and $50 after Dec. 25. You’ll get one premium drink ticket and one ticket for the champagne station and must arrive between 8:00 p.m. and 9:30 p.m. You must be 21 or over to attend the event. So get out and howl in the New Year! Looking for daytime fun for your kids to enjoy this New Year’s Eve? Look no further! The DoSeum Museum’s Kids Countdown offers a safari themed event with their traditional ball drop at noon. The event will also feature a scavenger hunt, face painting, and music. The fun starts 10:00 a.m. and goes until 1:00 p.m. on Dec. 31 and tickets are $12. Be sure to get the tickets quickly because the event sells out. Take your party animal out and roar into 2018! Looking to create a new family tradition this New Year’s Eve? Check out Dave & Buster’s Rivercenter for a night of food and family fun. The event is on Dec. 31 from 4:00 p.m. to 7:00 p.m. and includes two package options. The first package, for $34.03 per person, gives access to an appetizer buffet, desserts, unlimited soft drinks, a $20 power card for each guest, and a video ball droop to ring in the New Year. The second package, for $43.10, has the same food and drink options, plus a $25 power card and unlimited video game play. As a guest of the Family New Year’s Eve event, you are welcome to stay after the event time, until the Kid Curfew at 11:00. Round up the family and have a fun-filled New Years! This New Year’s Eve try some mystery at Paramour’s second annual NYE soiree. This year’s theme is Midnight Masquerade and will include delectable small bites, intoxicating elixirs, and exciting performances. Doors open at 7:00 p.m. on Dec. 31 with the entertainment starting at 8:00 p.m. and going until 2:00 a.m. Tickets range from $350 to $750. Grab your mask and enjoy some polished fun that won’t stop after the ball drops. Want more New Year’s Eve events in San Antonio? We’ll be expanding Your Guide to New Year’s Events in 2018 to be sure to check back here regularly. Connect by registering on 210area with a free subscription. You'll find things to do in San Antonio and more!